The B61 life extension program gets a gold medal for setting records as the most expensive nuclear warhead in U.S. history. It also gets another ignominious recognition – costing more than its weight in solid gold. The B61 bombs are the oldest bombs in the operational arsenal – first deployed in the 1960s. The Life Extension Program is intended to update and overhaul the warheads to keep them in the arsenal for decades to come, allowing the B61 to continue serving as the last remaining tactical nuclear warhead in the arsenal. The bombs remain deployed in Europe, despite broad recognition that they have no military utility. Unfortunately, the life extension program (LEP) for the B-61 nuclear bomb is now projected to cost $10 billion. When we first heard that, some quipped that the bomb must be gold-plated. It's not. That would be too cheap. How does the B-61 LEP measure up? Each of the estimated 400 B61-12 nuclear bombs will now cost approximately $28 million, according to Hans Kristensen at the Federation of American Scientists (a Ploughshares Fund grantee). That is 1.5 times its weight in solid gold. Let's put that in perspective. Each of the gold medals handed out at the London Olympic Games contains a minimum of 6 grams of gold. 700 pounds of gold is enough for 52,919 gold medals. That's five times the total number of Olympic athletes in London. For a bomb that has no place in a 21st century military strategy, $10 billion might be too much to pay. Instead of extending the B61's life, wouldn't it make more sense to let it finish its golden years in the dismantlement queue? 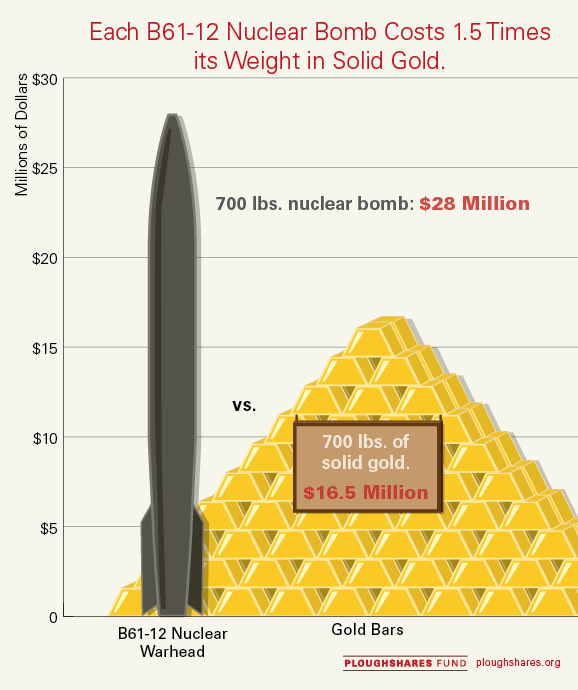 An astute reader pointed out that the B61-12 will actually cost $11.5 million more than its weight in gold. I underestimated it at $10 million more in the original blog. I made the mistake of calculating gold costs in imperial ounces, where gold is actually traded in troy ounces. Correcting my conversion error shows that 700 lbs. of solid gold is actually worth $16.5 million at the time of the original post. Special thanks to our reading for correcting me. This is a friendly reminder that, despite much progress reducing the number of nuclear weapons in the world, there has been much greater progress eradicating the imperial measurement system.